All APIs should be implemented based on the underlying Hardware Abstraction Layer (HAL) Build Support Package (BSP). Key Point: Unless noted as optional, Platform Abstraction Layer APIs are mandatory and must be implemented according to the definitions in each API header file. The Alarm API provides fundamental timing and alarm services for the upper layer timer implementation. There are two alarm service types, millisecond and microsecond. Millisecond is required for a new hardware platform. Microsecond is optional. Note: This API is optional. The UART API implements fundamental serial port communication via the UART interface. The Radio API defines all necessary functions called by the upper IEEE 802.15.4 MAC layer. The Radio chip must be fully compliant with the 2.4GHz IEEE 802.15.4-2006 specification. 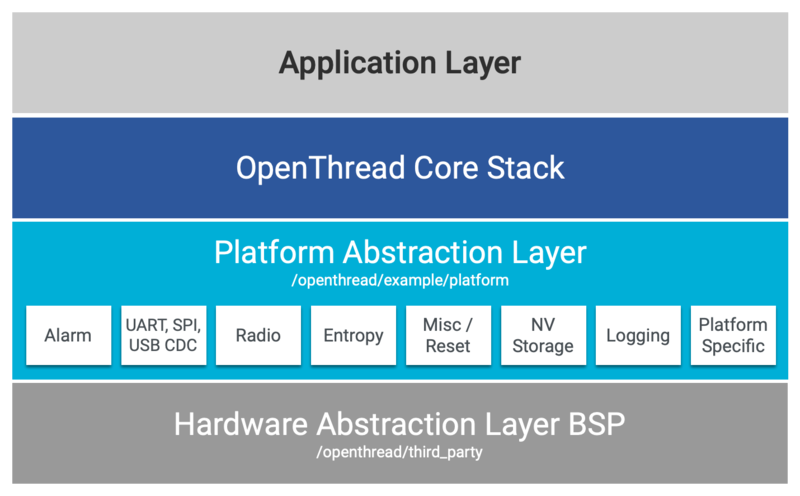 Due to its enhanced low power feature, OpenThread requires all platforms to implement auto frame pending (indirect transmission) by default, and the source address match table should also be implemented in the radio.h source file. However, if your new hardware platform example is resource limited, the source address table can be defined as zero length. See Auto Frame Pending for more information. Note: The otPlatRadioGetIeeeEui64 Radio API MUST return a unique administered factory-assigned IEEE EUI-64 that includes the manufacturer's OUI. The EUI-64 is used to match to steering data during the Joiner Discovery phase. The Misc/Reset API provides a method to reset the software on the chip, and query the reason for last reset. Note: Implementation of this API is required in every port of OpenThread. Note that many platforms have already integrated a random number generator, exposing the API in its BSP package. In the event that the target hardware platform does not support TRNG, consider leveraging ADC module sampling to generate a fixed-length random number. Sample over multiple iterations if necessary to meet the TRNG requirements (uint32_t). When the macro MBEDTLS_ENTROPY_HARDWARE_ALT is set to 1, this API should also provide a method to generate the hardware entropy used in the mbedTLS library. The Non-volatile storage API provides settings and functions for an underlying flash operation implementation to the upper layer. The Logging API implements OpenThread's logging and debug functionality, with multiple levels of debug output available. This API is optional if you do not plan to utilize OpenThread's logging on your new hardware platform example. The highest and most detailed level is OPENTHREAD_LOG_LEVEL_DEBG, which prints all raw packet information and logs lines through the serial port or on the terminal. Choose a debug level that best meets your needs. The System-specific API primarily provides initialization and deinitialization operations for the selected hardware platform. This API is not called by the OpenThread library itself, but may be useful for your system/RTOS. You can also implement the initialization of other modules (for example, UART, Radio, Random, Misc/Reset) in this source file. Implementation of this API depends on your use case. If you wish to use the generated CLI and NCP applications for an example platform, you must implement this API. Otherwise, any API can be implemented to integrate the example platform drivers into your system/RTOS.